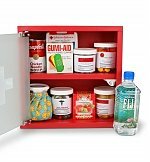 Perfect get well gift ideas to send impressive and thoughtful get well wishes that will surely warm your patient's heart and soul. This charming get well gift basket is contained in a lovely trunk with Chicken Soup for the Soul, the New York Times number 1 bestselling book on life, inspiration and wisdom. 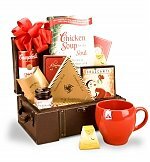 This gift basket get well gift idea includes Campbell's Chicken Noodle Soup, Peppermint Chamomile Tea and an included mug, Croccante Cookies, Roasted Almonds, Seasoned Crackers, Brown & Haley Almond Roca, and delicious Huckleberry Jam. Measures 12" x 7" x 6".